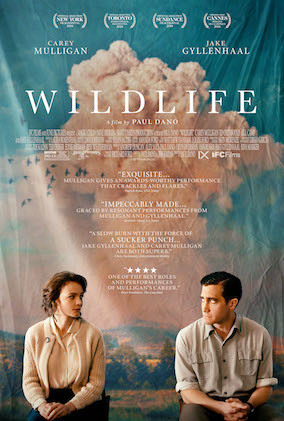 Wildlife, the directorial debut of Paul Dano (There Will Be Blood, Little Miss Sunshine ), co-written along with Zoe Kazan (The Big Sick). Elegantly adapted from Richard Ford’s novel of the same name, Carey Mulligan (Mudbound, An Education) delivers one of her finest performances to date as Jeanette, a complex woman whose self-determination and self-involvement disrupts the values and expectations of a 1960s nuclear family. Fourteen-year-old Joe played by newcomer Ed Oxenbould, is the only child of Jeanette (Mulligan) and Jerry (Jake Gyllenhaal)—a housewife and a golf pro—in a small town in 1960s Montana. Nearby, an uncontrolled forest fire rages close to the Canadian border, and when Jerry loses his job—and his sense of purpose—he decides to join the cause of fighting the fire, leaving his wife and son to fend for themselves. Suddenly forced into the role of an adult, Joe witnesses his mother's struggle as she tries to keep her head above water. With precise details and textures of its specific time and place,Wildlife commits to the viewpoint of a teenage boy observing the gradual dissolution of his parents’ marriage. Paul Dano ,highly acclaimed for his acting roles in There Will Be Blood and Little Miss Sunshine, among others, made his directorial debut in 2018 with Wildlife, which screened in competition at the 2018 Sundance Film Festival. Dano wrote the adapted screenplay (with Zoe Kazan) from Richard Ford's American classic. Dano also produced the film.